Before the Storm takes place between 7.3.5 and 8.0 game patches. 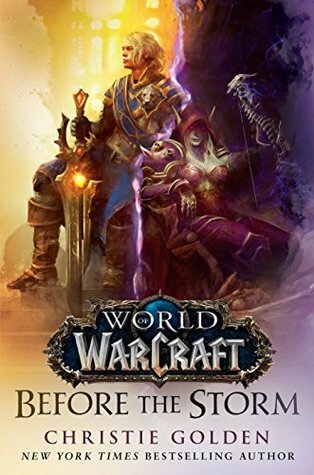 It pretty much begins with the two in-game cinematics that were released after the defeat of Sargeras and which Golden was cooperating on with the cinematic team as they were based on the book (even though released way before). The book shows slightly more on both sides and reveals what is happening in the background. Sylvanas, not really liking the position of Warchief, is forced to spend more time in Orgrimmar, leaving her people feeling forsaken (pun intended). Yet, something that did not feel surprising to me, she also shows that she barely cares for the Horde she was made to lead. Even though it’s not obvious from the cinematic, she does not even like Gallywix who is the one offering to share what he knows about Azerite – only because he knows that Sylvanas is willing to pay him well for its potential and it’s very quickly revealed that she means no good. Not really surprising. While she thinks how much damage she could do and about her ambitious plan, Anduin thinks about what it could fix and starts his efforts to bring those who could help with it together, with the help of Magni Bronzebeard. There’s one more important plot point related to Sylvanas and the Forsaken, related to an unofficial ruling council that came to be with her absence to care for the city and they eventually plan to let those who became Forsaken to meet their still-living relatives, should those agree to it. Sylvanas sees it as a bad idea with some personal reason while Anduin sees it as the idea that could help peace and understanding, even though he’s initially only one of the few who actually believe it. There’s also a story of a goblin and a gnome that are former partners reunited by chance and work together on exploring Azerite’s potential and hopes for some good coming out of it only to be contacted by Gallywix and his desire for gold, realizing nothing good would come from that. Now, without spoilers, there are some things that maybe did not work the way they were expected to work if the goal was to show that Sylvanas might be dancing around the line. No. For me, she crossed the line to evil long ago and since Stormheim story, I consider her fully evil (in case I had doubt before). In that regard, what went on on the others side was less predictable and with Genn and Turalyon and their reaction to undead Alonsus Faol and what he told them…, there were surprises. It still leaves some open questions for what’ll actually happen in the game soon, which is logical for this type of tie-in book. It also revealed a bit more about Calia and her disappearance and mentioned some memorable moments (Genn and Anduin on Broken Shore). It was a bit strange to see nothing of Varok Saurfang, considering his involvement in the coming in-game content. My highlights from the book – some just as a proof that Sylvanas is evil, some being memorable. This entry was posted in Books, Fantasy, Gaming and tagged book, book review, Fantasy, world of warcraft. Bookmark the permalink.